Why wait, when the steel gear upgrade were already available for free? I guess I missed that. Who has the steel gears? For sure the steel gear is going to be more durable. Bafang had the steel gear for Ultra. Just ask your supplier to request a replacement from them. As for Luna they should have stock. Do you notice Luna price were much higher than Alibaba below US$500 with free shipping. I originally just came here to ask Ivy from Frey why some of the Bafang Ultra motors have an orange "BAFANG" on the cover plate and some are just black and white. I've been trying to find a pattern and so far none. The photos on the Bafang website show black and white, the photos on Luna's website show 3 different versions of black and white: one blank plastic-looking, one blank with deep metallic-looking ridges, and one with white "LUNA" lettering, but no orange. 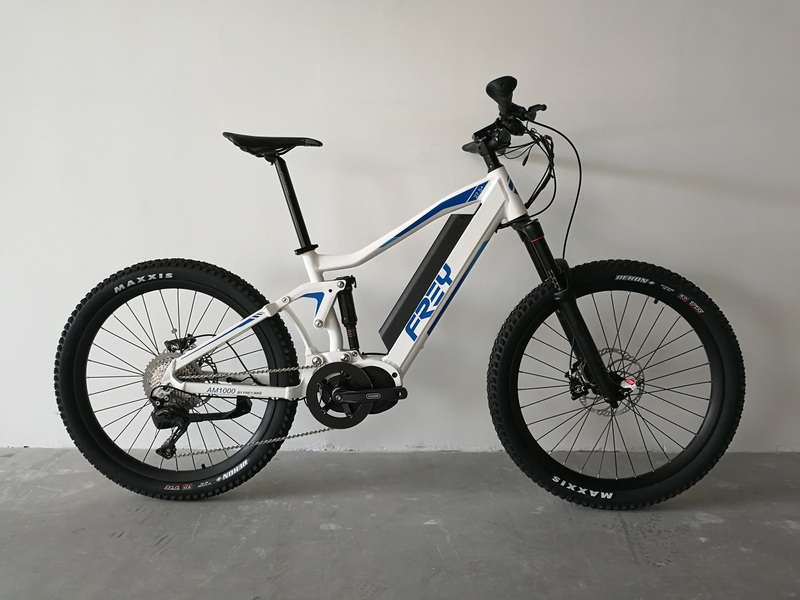 The kits for sale on alibaba are all black and white, but the actual complete bicycles for sale all seem to have the Bafang Ultra 1000 watt motor with the orange cover. Anyway, when I got here, I saw other postings that raised a few other questions I have, and I apologize if these go a little bit off on a tangent from the Frey AM1000 topic, but they are related to other posts I'm seeing here, so I thought it would be best to post here. 1. Someone posted photos of an Sduro to which they had welded the aluminum mounting bracket, including the chainstays. The Sduro is a 6061 aluminum alloy, which I heard is weakened below 40% of its original strength during welding and must be heat treated after welding. The heat treatment process includes heating to 1000 degrees and then immediately quenching, which warps the shape of the aluminum so much that without proper equipment it is extremely difficult to return it to its original shape. So professional frame builders weld then heat then quench with the frames held in special equipment that keeps it from warping. Then it has to go through subsequent stages of heat treatment at lower temperatures. The 7005 aluminum alloy is more forgiving and supposedly you can get away with not heat treating after welding. And with the 6061 alloy, Karl suggested that if it's a good weld, 40% of original strength is probably okay, but not with chainstays involved, which they are for the Sduro, so that's why I figured I'd ask, "in general, are people finding the 40% of original strength to be adequate?" "The Mag ultra is made from magnesium weighing 2 pounds less than the standard drive." "We replace the internal nylon gears with stronger steel gears and use our own proprietary sine wave controller to make all this possible." Eric: "the whole unit is 2 lbs heavier than the HD"
Josh: "It's that nylon gear keeps it quiet"
Eric: "I know that people are considering making these metal to make it even stronger, but we haven't seen many failed nylon gears..."
Josh: "no, even in the HD." "The BBSHD is 12 lbs, the Bafang Ultra is 16 lbs"
"All new Bafang Ultra motors are made with casing made from magnesium [and 2 other metals he mentioned]." To control how quickly the motor cuts out after you stop pedaling, since I've seen this issue mentioned by a few different people. Time of Stop(x10ms): 25\25\25\25\10– This affects how quickly the drive stops after you stop pedaling. Some people report that setting this lower (as low as 5) may affect the startup delay on the throttle. If you set it to 0 the PAS system ceases to work. 25 is probably too high. This setting disables the PAS if it is set less than 5. I strongly recommend setting this to 5, especially if you want to use the PAS system without using ebrakes. If you set this less than 10 on the v2 of the BBS02 controllers then your PAS will not work properly at all. On the older BBS02v1 controllers and the BBSHD controllers you can set this as low as 5 before you start having issues with the PAS. Although in my software, I didn't have "Time of Stop(x10ms)", mine always showed as "Stop Delay(x10ms)"
But Karl says most of these settings in Pedal Assist tab are ignored, so do either of these have any effect on turning off the motor after pedaling stops? I'd like to have the AM1000 fat bike version without the motor. Slap the Luna Cycles Ludicrous 2500W Ultra in there. Now that would be the perfect bike! Power for fast commute and yet can hit the mountain bike trails. i experienced testing the controller settings on my own. it becomes better, but i am not done yet. i will post screenshots of my setting, when i am satisfied with it, but i can say i am far away from karl. Mine's getting ready to ship!!! All of luna's drives are magnesium have a sine wave controller and are made exclusively for luna. I am friends with the owner of Luna and i can tell you he always has an ace up his sleeve and does the opposite of marketing keeping a lot of their advancements, upgrades, special editions secret. I dont know why Eric is kind of nutso that way. I can say I recently visited their El Segundo facility and they are true innovators and are really striving to make incredible advancements in ebikes and ebike parts. Honestly I do not know who compares and they are moving at 100mph. To be honest the bikes they are building are really something special. does someone had "error code 30 - communication failed" ? Does it have the steel gear too ? I saw from Paxtana on a diff forum that the Ludi version has one but no official confirmation. Yes it does come with steel gear. I have read from Paxtana forum and find out the Luna Apex was a joke. One of the customer who bought it around US$8K and achieved maximum speed of 30 miles/hr, while advertise as 40 miles/hr with ludicrous peak 2,500 watts. My hardtail Standard Ultra (Peak 1,350 watts with 48V 17ah) still with the nylon gear (lazy to replace it with the steel replacement) achieved 40 miles easily. Done with Sport Mode PAS 5 44T wheel chain with highest gear 11T EX1 Cassette. I believe Frey bike could also achieve such high speed without breaking your bank. To be honest, 40 miles is pretty fast for me, I usually ride in Eco Mode PAS 1 or 2 to get around 20miles speed with moderate gear setting. Orange and yellow color pattern decales. similar as Bafang orange color. How do you think about it? I'd like to answer your question about the Bafang Ultra motor version, the earlier one come out with silver background, now all come with orange backgroud logo. you saw the kits for sell on Alibaba I think the suppliers have not update the pictures upload earlier, that's why you see in the way. And now all motors come with steel gear. I have got my Frey AM1000 a while ago and I am really happy so far. I have tested it on my local trails and its doing really well. Can't wait to take in into the mountains now the weather in the UK is finally getting better. Unfortunately I have now lost my charger while doing some work on the house. I feel really stupid but I really cant find it. Where can I get a new one? I get it from Aliexpress. Or you could try Amazon. If you really can't find it locally. We can support. Does anybody used the bike already for offroad + downhill on single-trails? I want to you know how the frame is performing, how stiff it is? If somebody can say something about the downhill 'performance' or the big differences to the premium bikes it would be great. I had the same idea, using this bike on the local (downhill) trails with bumpy and rocky terrain. But I am new to MTB'ing in these types of environments and would like to know your views on what is necessary. Mine is shipping and as soon as I have it I will begin the reporting as I only ride single track! looking forward for yr. reports. Hope that the frame is made for heavy usage and samll drops . My normal bike is a Enduro MTb (Canyon Spectral). Compared to my old MTB KTM full suspension there are wolrds between on how it performs downhill. Meaning specially the agility in turns and a lot more of subjective impressions. I rod last year a Scott Genius E-MTB and it was great also in downhill. I compared roughly the Geometry of the Frey to other brands. What I found out that the chain stay CS is relatively long. Short CS is good for agility. Maybe the size is bigger because of the bigger bafang motor? In many e mtbs the motor is not horizontal attached it is inclined to allow for “shorter” frame. Also the wheel base is long… ok head tube angle is almost same 66,5°. Maybe this is all belonging to the difference in experience of the brands. But this are all theoretical figures on the paper. I personally belief that this geometry sience is more marketing from the brands to make each year money with new designs. But somehow it will influence how it drives. My concern is more on the long time durability of the frame. So I’m really looking forward to get some information how it drives. So the chainstay is 15mm longer than the Turbo Levo FSR Comp, that's just a hair over a 1/2". Now on my Ellsworth Epiphany Convert 27.5+ tires it's 466mm that is 8mm difference, plus this is not an ebike but to get the plus size tire clearance you need a longer chainstay. My older Epiphany 27.5 without plus tires as 439mm and also only 120mm of travel. So if you compare apples to apples I think the chainstay is right there especially for the price. Can only hope it lives up the the fun factor hype! 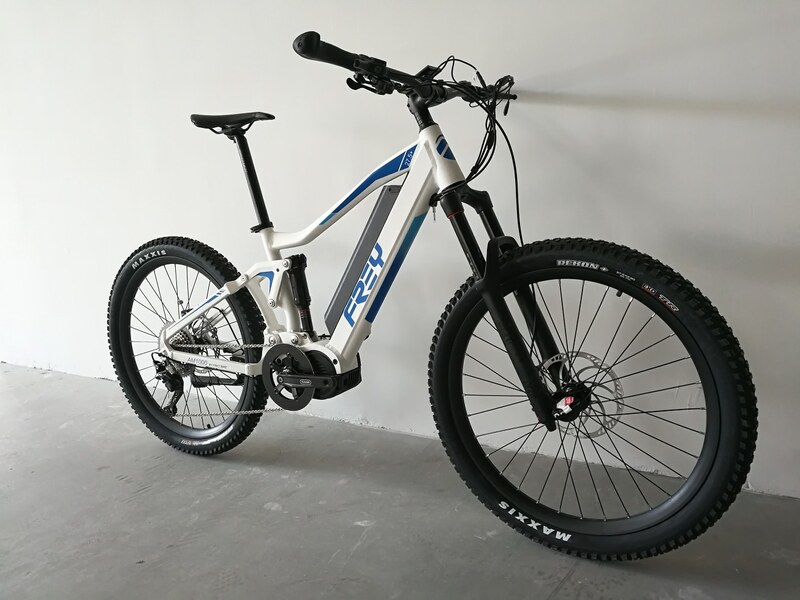 The turbo Levo is 29" and CS is shorter. The Wheelbase is also shorter. As said this is an endless discussion what the marketing departments of the brands initiated. But as you said for the given price Frey is top. Don’t want to think about the prices of the premium brands. 5.000,- ….. 9.000,- EURO for a bike ridiculous. Looking forward to all your reviews on the use of this bike offroad. I have made an order with Ivy as well. She was super helpful in answering all my stupid questions and requests. Well at least the new wheels are here!